These ideas are really great! You have no idea how many things can be created with just a simple clay pot! And for the holidays, it's the ideal material; solid and warm. 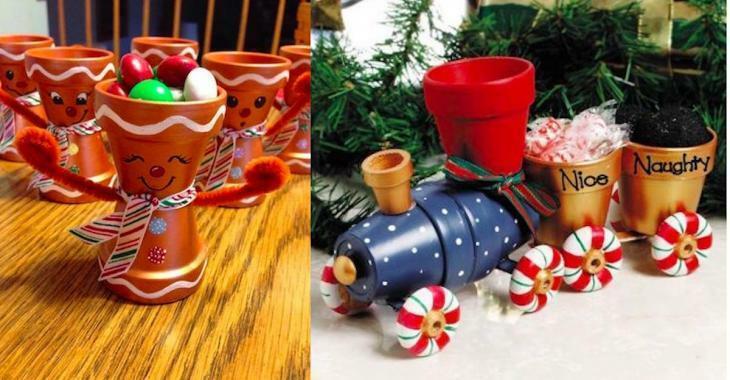 Whether decorating your home for Christmas or making gifts with your kids that they can offer to their teachers or family members, these pots are a great idea! Daycare educators will also find inspiration here to organize hands-on craft workshops with the little ones they care for. When Santa Claus gets stuck in the chimney, that's always a good laugh! Add the name of each of your guests to each ornament and now you have very nice place cards! This little train is so cute! You can put candy or small holiday flowers for a magical effect. With the small terracotta pots from the discount store, you can create beautiful snowmen, to place on a hutch or hang in the tree. These little gingerbread characters are too cute! Filled with treats, they are irresistible! This idea is simple yet so great all at the same time! A terracotta pot, a round container with lid. A few ornaments and voila! The perfect cookie jar for the holiday destivities! Or, you can choose to create the 3 wise men (Magi)! 8. A family of snow-people! Shall we put it on the tree? Rudolf always steals everyone's hearts! A unique decoration, out of the ordinary. He will take you to The Nutcracker! Because yes, we do love the Grinch! Isn't he just too cute? Love is such a beautiful thing, especially during the holidays! This can also be used as a candy jar, if it's not lightened-up. He' quite stylish this one! You can also plant poinsettias! Have these photos motivated you to create some unique and fun projects for the holidays?